While renovating the old servant's quarters on their property, Rowan's family discovers a skeleton buried beneath the floorboards. Rowan and her best friend love a mystery so they begin trying to figure out who the skeleton was and who murdered him nearly 100 years ago. Their main clue is a receipt for a Victrola with two sets of initials on it. In alternating chapters, Will is living in Tulsa during the time of the Jim Crow laws. After he is part of a violent incident based on race, his vision of life begins to change and he is pulled deeper into the divide between white and black. I was trying to explain the book to my husband and he ended up confused because SO MUCH happens here but it is all expertly woven into the story. I was captivated by both timelines and fooled about the identity of the skeleton several times. 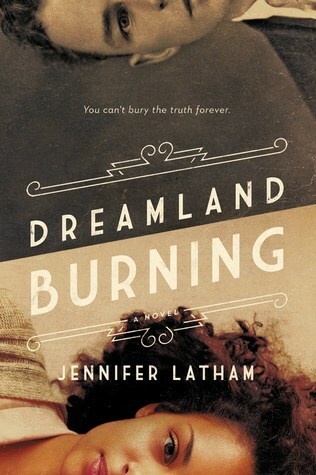 The mystery in Dreamland Burning is great and the book would be worth reading for that reason alone, but there are three other parts to the book that are even more important to me. 2. The characters in the book are all kinds of good and bad and many of them are both at different times in the story. Our introduction to Will shows him to be not so great but by the end of the book he is quite heroic. His father transforms in another way. Even Rowan, while not as dramatic of a change, comes to some realizations that change her character throughout the book. I am impressed with how Latham is able to build depth into her characters somewhat effortlessly, by which I mean it looks effortless from the outside but probably took a lot of effort on her part. Like many real people they are layered and flawed, not easily pinned as good or bad. 3. The issues of race are twined into every event in the story. Oh sure, there is a build up to a huge race massacre, but the uncomfortable, everyday ways in which race impacts our lives is ever present in Dreamland Burning. There is plenty of racism. most of it overt, in Will's storyline which you would expect at the time of Jim Crow. But more importantly, Latham shows the many "small" ways racism is alive and well in the present. It shows up when Rowan attends a concert, in her reaction to a homeless man, in the way her father is treated by authorities, in her own feelings about how people of color are treated, and in a dozen other ways that aren't labeled by the author with a neon sign but that are just part of modern day reality we manage to gloss over. Just go read this powerful book!